Well, although I’ve decided to take a break, possibly an extended one, from writing daily short stories (don’t worry, normal daily articles and art posts will continue 🙂), I thought that I’d collect links to all 24 of the short stories I posted here this month in case you missed any of them (like I did with the nine stories I wrote in February). You can also find links to lots of other short stories on this page too. I’m still amazed that I managed to write a total 33 short stories in a row (the most I’ve managed before is fourteen stories) and the highlights of this month’s collection include: ‘Floor Seven‘, ‘Stage Fright‘, ‘Rusty‘, ‘Expo‘, ‘Haunt Of The Horror Comics‘, ‘A Märchen In March‘, ‘Village‘, ‘Demo‘ and ‘Last Refuge Of The Splatterpunks‘. – “Haunt Of The Horror Comics“: This is a short story, set in mid-1950s Britain, about a couple who visit a corner shop shortly before horror comics are banned. – “Culture“: This is a random character study – set during the ’00s – which follows a goth who visits a goth club for the first time. Originally, this story was supposed to be a sarcastic comedy, but it ended up going in a slightly more serious/literary/poignant direction instead. – “Floor Seven“: This is a creepy horror story, set in 1990s America, that I wrote because I wanted to try writing something that evoked the grungy claustrophobic gloom of many classic mid-late 1990s Hollywood horror movies, TV show episodes and videogames. – “Expo“: This is a random story, set in 2000/2001, about a games journalist who visits a videogame trade show/exhibition in London. – “A Märchen In March“: This is a vaguely Lovecraftian horror/fantasy story (with some very mild thriller elements too) that was inspired by the recent snowy weather. It’s a little bit more of a descriptive and “serious” story than usual, but it was interesting to write. – “Background Music“: This is a somewhat rambling, semi-autobiographical “stream of consciousness” style piece that I wrote about having random daydreams during heavy metal concerts. It probably isn’t my best story, but it was kind of fun to write. – “Food Court ’95“: This is a slightly random and mildly comedic vignette, set in mid-1990s America, that I wrote when I was tired (so, it’s probably filled with historical errors, Briticisms etc..). It basically just involves a punk and a frat guy sitting in the food court of a shopping centre and trading sarcastic and/or cynical dialogue with each other. Still, for something I wrote when I was tired, it turned out relatively well, I guess. – “Heist“: In the distant future, two criminals are trying to hack their way into the vault of a storage facility. But, there’s a problem! The security robots are closing in on them and they’ve only got one plasma pistol between them. – “Frat House Blues ’95“: Here’s the long-awaited sequel to “Food Court ’95“. Ok, I actually wrote this because one line in “Food Court” made me wonder what Roy and Lucy’s Friday night would actually be like. Needless to say, it includes lots of sarcastic dialogue and a couple of ’90s pop culture references (including a potentally anachronistic one). – “Common Factor“: This bizarre cyberpunk story was the result of both spending too much time reading “Snow Crash” by Neal Stephenson* and watching multiple Youtube videos about obscure musical instruments. (*due to major scheduling differences between these short stories and my daily articles, my review of this novel won’t appear until next February. Even so, there will be a review of Stephenson’s “The Diamond Age” in December ). – “Rusty“: …And this cyberpunk comedy story is what happens when I play “Doom II” for the first time in about two weeks (how did I get that out of practice so fast?) and then find an absolutely hilarious pirate-themed music video [Explicit lyrics] on Youtube. This short story is also something of a spiritual successor to this cyberpunk story I wrote in 2016 too. – “Trance“: This is a cyberpunk story that includes no electronic technology whatsoever. And, although I tried to write something like this in 2016, this one actually technically fits into the criteria of “cyberpunk without electronic technology“. – “Chess“: Somehow, this ended up being a story about… chess.. of all things. It’s kind of a mildly “literary” story, with some comedy elements. – “Stage Fright“: At a heavy metal concert, something evil is lurking in the audience! This gloriously cheesy 1980s-style comedy horror story was sooo much fun to write 🙂 I wrote the first draft of it on the day that the new Judas Priest album came out, so no prizes for guessing what I was listening to when I wrote it. – “Order“: In a dystopian future, someone is questioned about membership of a mysterious secret society. And, yes, I’m surprised that it’s taken me this long to write any dystopian fiction. And, if anyone is curious, the meme mentioned in the story also makes a secret appearance in this article I posted in February. – “Last Refuge Of The Splatterpunks“: An old 1980s horror author discovers something terrible about one of his old books and decides to drown his sorrows at the pub with a fellow ’80s horror author. And, yes, this story was inspired by something I saw when looking online for modern splatterpunk fiction that brought out my inner grumpy old cynic and literally made me say something like “In my day…“. And, well, I only discovered splatterpunk fiction during the 2000s! – “Village“: A couple get lost in the countryside and find themselves in a small village – but, the village isn’t on the map! This gothic horror story, set in the late 1980s/early 1990s, was inspired by a recent visit to a small village called Southwick. – “Grim“: A man is shopping in a run-down shopping centre when he notices that a certain robed, scythe-wielding fellow is following him.. This story, set in the 2000s, was kind of fun to write (and I’m seriously surprised that it’s taken me this long to use the Grim Reaper as a character) although it was a little bit rushed, and it probably shows. – “Deadline“: This random Lovecraftian/magic realism/2000s nostalgia story was something I wrote when I was in an uninspired mood. It probably isn’t my best work, but I’m still surprised that I managed to write something. – “Snow Beast“: Wow! I can’t believe that it has taken me this long to write a monster story 🙂 This story was inspired by the recent “mini beast” snowstorm here in the UK, and it can also be read as something of a prequel and/or companion piece to this story from 2-3 weeks ago. – “Blank“: I had writer’s block, so this story is the ultimate lazy cop-out (a story about a writer getting writer’s block). It’s a bit like the story a couple of days ago (“Deadline“), but with more comedy and commentary about the horror genre. The final two paragraphs of this story turned out vaguely ok, but the rest of it isn’t brilliant. Although I plan to write more stories next month (stay tuned for the next one tomorrow night 🙂 ), I thought that I’d take a break tonight in order to compile a list of links to all of the stories I’ve written this month, in case you missed any of them. You can also find links to some of my older story collections on this page too. Since my return to writing short stories was something of an unplanned thing, I foolishly didn’t prepare a “buffer” of stories in advance. As such, at least a couple of the stories were plagued by writer’s block and didn’t turn out that well. Even so, I quite like how a few of them turned out and my favourites are probably: “Specimen“, “Temple” and “Wake“. – “Amusements“: This is a random comedy horror short story that I wrote somewhat unexpectedly. – “Temple“: This is a short story about abandoned shopping centres, nostalgia, ubiqity, folklore, US pop culture, early 2000s Britain etc..
– “Off Hours“: This is a mildly comedic “film noir” style story that I wrote whilst experiencing writer’s block. – “ESP“: This is a short story about someone who develops a psychic connection… to the internet. – “Wake“: This is a vignette about three university students at a house party. It was more of a random practice piece/literary experiment than anything else, but it’s also something of a mildly comedic nostalgia piece about the 2000s (of all things) too. – “Alarm“: This is a sci-fi comedy story about space stations and software updates. – “Wave“: This is a slightly random short story about 1990s nostalgia, car boot sales and a university student trying to write a dissertation proposal. It’s a little bit on the rambling side of things (and it borders on being pretentious “literary fiction”) but it was fun to write. – “A Playlist For Suburbia“: Well, I had writer’s block. So, I ended up writing this random character study about a guy listening to punk music. And, yes, this ended up being another 1990s nostalgia story. Arrr! Avast ye scurvy dogs! This be an article about piracy! No, not that kind of piracy – quite the opposite in fact. Following the popularity of my article from last year about five cyberpunk inspirations that can legally be read/viewed/played for free, I’ve been meaning to write another article in this style. And, after watching the first few episodes of a TV show called “Black Sails” on a second-hand DVD, it suddenly struck me that “pirates” would be a good theme for this article. After all, this is a genre that can be serious, funny and/or thrilling. It is also, like the cyberpunk genre, a cool genre that has fallen into obscurity slightly over the years. Plus, unlike the cyberpunk genre, it’s actually easier to find free inspirations in this genre since it’s old enough for the copyright to have expired on some things. However, I’ll also be including things that are still covered by copyright, but have been officially made available to view, listen to, play etc… for free by the copyright holder. I’ll also be taking a relatively strict definition of the word “free”, which means that things like “Pirate Doom” (a free fan-made add-on to a commercial game called “Doom II”) or things that were previously released for free but no longer seem to be available on official sites (like the “Rough Diamonds: A Tribute To Running Wild” album that used to be freely downloadable from Running Wild’s website 5-10 years ago) won’t be included on the list. However, a free demo for an old commercial computer game will appear on the list – since you don’t actually have to spend anything in order to play it (and it is free from modern scams like micro-transactions etc..), and it has been officially made available for free. Likewise, if you’re unsure of the difference between taking inspiration and lazy plagiarism, then be sure to read this article. 1) “Treasure Island” By Robert Louis Stevenson: Well, this is the obvious place to start. Since this incredibly famous pirate-themed novel was published in the mid-late 19th century, it is free from copyright and can be legally downloaded for free from numerous places on the internet (like Project Gutenberg). Although it’s been over a decade since I actually read it, it is the source of a lot of modern pirate-themed tropes (such as parrots on shoulders etc..) and is a defining classic of the genre. Interestingly though, given that it was written in the 19th century, the pirates are actually the villains in this story. This is kind of a common theme in a lot of old pirate-themed things, but it may be surprising if you’ve never read anything pirate-themed from this era. Plus, according to Wikipedia, it was inspired by an out-of-copyright history book from 1724 called “A General History Of The Robberies and Murders Of The Most Notorious Pyrates” which, although it apparently isn’t the most accurate of historical sources, can also be legally read, downloaded etc… for free. 2) Sherlock Holmes vs Blackbeard! – “The Pursuit Of The House-Boat” By John Kendrick Bangs: If you want something a bit funnier and more surreal, then I can’t recommend John Kendrick Bangs’ 1897 novel “The Pursuit Of The House-Boat” highly enough! This out-of-copyright novel is a sequel to Bangs’ “A House Boat On The River Styx” and, like with that novel, it revolves around the ghosts of famous historical figures and famous fictional characters who spend the afterlife living on a rather luxurious house boat that floats on the River Styx. In this novel, the house boat has been stolen by the ghost of the notorious pirate Blackbeard and it is up to the ghost of Sherlock Holmes to track it down and get it back! Although a few elements are slightly old-fashioned, this story is surprisingly funny for something written in the 19th century. Plus, it’s a story about Sherlock Holmes versus Blackbeard. From the 19th century! 3) Official music videos: Good pirate-themed music can be hard to find. So, I thought that I’d mention a few interesting pirate-themed official music videos (from official accounts) on Youtube that might be interesting. Yes, all of these are still copyrighted – but their creators/copyright holders have made them available to view and listen to for free. If you want something a little bit more traditional in style, then I’d recommend checking out the music video to a modern acoustic song called “The Pirate Shanty” by Worldwide Adventurers. Likewise, the original lyrics to the traditional pirate-themed song “The Derelict” (the “Yo ho ho and a bottle of rum” song) have passed into the public domain and the song has been covered/performed by numerous amateur and professional musicians on Youtube. However, each modern interpretation and/or variation of the song is still copyrighted – even if the original 19th century lyrics aren’t. If you want something a bit more… metallic…. then I would recommend pretty much any official music video by Alestorm – such as the video to “Shipwrecked“.They’re a heavy metal band (who I’ve seen perform live at least twice) who literally only sing songs about pirates. Plus, all of his paintings are also completely free from copyright (under both American and European copyright law) and this includes a number of cool pirate-themed paintings, like “Who Shall Be Captain?“, “Buccaneer of the Caribbean” and “Captain Kidd“. 5) The free demo of “The Longest Journey”: Although “The Longest Journey” is a commercial computer game (which mostly doesn’t revolve around pirates), there is an official free demo of the game that might be of interest to any fans of the pirate genre. Although it is also apparently available on various archive sites, the easiest (and safest) place to find this free demo these days is on the game’s official Steam page. However, this also requires creating a Steam account (and the games on that site have internet-connection based DRM). Still, the full game is also available on other legitmate game sites, and second-hand official DVD-ROM copies of it also exist too. Although most of the game takes place in both a sprawling futuristic cyberpunk city and a large tropical fantasy world, the free demo is restricted to one of the few self-contained parts of the game. In other words, a short puzzle-filled sea voyage on a vaguely pirate-style galleon. Although it doesn’t technically involve pirates, there are telescopes, sails, the occasional piece of pirate-style dialogue and other such things that may be of interest to fans of the genre. However, the demo takes place about halfway through the events of the game, so it may be a little confusing and/or contain mild plot spoilers. Anyway, I hope that this was useful 🙂 Ahoy mateys! Well, for today, I thought that I’d talk about one of my favourite elements of the detective/crime genre – I am, of course, talking about stories that deal with “obsolete” crimes. This is something that I was reminded of after I happened to find a cheap second-hand DVD of the first season of an amazing historical crime drama called “Boardwalk Empire“. Although I’ve only seen about three episodes of it at the time of writing, it’s a drama series about prohibition-era America. The main character (played by the one and only Steve Buscemi) is a corrupt city official who is involved in several bootlegging operations, whilst trying to fend off the attentions of a fanatical revenue agent and to deal with the complex politics of various roaring twenties-era criminal gangs. In a way, it’s very slightly similar to “Breaking Bad” but, as I’ve mentioned before, I absolutely couldn’t stand that show. Although both shows are about the grimy world of the trade in illegal substances within America – there’s one major difference between the two series. The shady world of bootleggers and prohibition-era gangsters in “Boardwalk Empire” doesn’t exist any more. The idea that alcohol was ever criminalised is (especially to a British person like me) absolutely laughable. In other words, bootlegging is an “obsolete” crime. Depictions of it can’t be seriously depressing, scary or disturbing for the simple reason that it shows a “crime” that virtually no sensible person these days would consider to be immoral or terrible. It shows people gleefully breaking an unjust and irrational law (unlike, say, the sensible laws against the manufacture and sale of hard drugs that the main characters in “Breaking Bad” go against). Stories that deal with “crimes” that society has long since rightly decided shouldn’t be criminal are absolutely fascinating, especially since historical LGBT stories also fit into this genre too (I mean, it’s only been 50 years since the old unjust laws regarding this even began to be repealed in the UK). Stories about “obsolete” crimes are both rebellious and reassuring at the same time. Since, not only do they reassure us that both common sense and basic human nature will always win out against harsh political ideology, but they also allow us to think about our own lives in a slightly “rebellious” way. They remind almost everyone that, at various points in history, the establishment saw virtually everyone as “dangerous” in some way or another. After all, unless you’ve never enjoyed listening to any kind of rock or rap music, unless you aren’t LGBT, unless you’ve never voted (regardless of your gender, ethnicity, economic class, religion etc.. at some point in history, the establishment somewhere didn’t want you to vote! ), unless you’ve never drank any booze, unless you’ve never played violent videogames, unless you are a devout follower of the dominant religion in your country, unless you’ve never disagreed with the government etc… then you’ll probably be able to see a little bit of yourself in the protagonists of these stories about “obsolete” crimes. You’ll feel like a little bit like a “rebel”, even if you lead the most non-rebellious life possible. These types of stories are absolutely fascinating because they turn the crime genre completely on it’s head – the “criminals” are the good guys and the detectives are the villains. So, these stories automatically set themselves apart from most other stories in the crime genre since, even in “traditional” crime stories where the criminal is the protagonist, there is still usually a large degree of moral ambiguity involved. This isn’t a bad thing, but it changes how the audience interprets and reacts to the story when compared to a story about an “obsolete” crime. The emotional dynamics of the story are totally different. Another interesting thing about these stories is that they also make us think about the whole subject of just and unjust laws. In other words, they make us look at our own moral principles, because these stories often have parallels with the modern world. In other words, they make us think more critically about the legislative process and help us to refine our own moral opinions about the merits of current legislation. These stories can obviously also be used to satirise present-day attitudes and politics too. I mean, the contrast between the wild spectacular parties and the dour, depressing temperance hall meetings near the beginning of the first episode of “Boardwalk Empire” are an absolutely brilliant send-up of a certain type of modern conservatives and/or “liberals” who just instinctively hate any kind of joy, laughter, relaxation or freedom – and want to see it all stamped out immediately. In conclusion, these types of stories are an absolutely brilliant subversion of the crime genre, which also hold a mirror up to the audience and make us question our own moral and philosophical principles in a way that “traditional” crime stories just can’t do. Although I regret to say that, at the time of writing, I have not written a “serious” story that features the great detective, I’ve done the next best thing. I’ve written parody stories inspired by Sherlock Holmes. If you’re not interested in reading my nostalgic ramblings about them, then feel free to skip the next three or four paragraphs. When I was about sixteen or seventeen, I had a lot of fun writing a series of unpublished short comedy stories (featuring a Holmes-like character called Dalton Coates and a Watson-like character called Larry Richs) set within the college I was studying in at the time. These were stories with titles like “The Adventure Of The Missing Mouse Ball”, “The Invigilator Substitution Scandal” and “The Case Of The Disused Classroom”. When I later went to university, I ended up writing another Richs & Coates story called “The Hound Of The Student Halls”. I also briefly revived the series for three short comedy stories in 2013- 14 (set several years later, when Dalton Coates has become a Tory MP) – called “The Case of The Phantom Funds” , “The Case of The Uncertain Constable” and, my personal favourite, “The Case Of The Absent Snuff-Box“. Anyway, Sherlock Holmes is is one of the easiest characters for comedy writers to parody. Still, if you want to write a Sherlock Holmes parody story and don’t know where to start, then here are a few very basic tips. 1) Read the original stories. All of them: One of the easiest ways to learn how to write funny stories about Sherlock Holmes is just to read the original stories themselves. Depending on where you live, all or most of them are in the public domain and can be legally read for free on sites like Project Gutenberg. If you prefer reading traditional books, then it isn’t like modern reprints of Sherlock Holmes are that expensive (eg: if you’re in the UK, then the Wordsworth Classics and Penguin Classics editions of the stories are worth checking out if you don’t want to spend too much). The reason why it’s important to read as many of the original stories as you can is because it’ll give you a sense of the narrative voice that Sir Arthur Conan Doyle used. After being exposed to tens of thousands of words of Conan Doyle’s wonderfully dramatic Victorian narration, you’ll get a good feel for it and be able to copy it fairly easily. Reading the original stories will also show you a few of the techniques that I’ll be mentioning in this article, such as…..
2) Amusing case names: One of the cool things that Sir Arthur Conan Doyle did in his Sherlock Holmes stories was to have both Holmes and Watson talk about cases that never appear in any of the “official” stories (the classic example is the case of the “Giant Rat Of Sumatra”). Doyle used this technique in a “serious” way in order to make Sherlock Holmes appear to be a more experienced character, to add more realism to his stories and to intrigue the audience. However, it is also perfect for comedy too. 3) Change the setting: Sherlock Holmes is a timeless character and this is why he has appeared in films and TV shows that have been set in time periods from World War Two to the present day. It is, theoretically at least, possible to set a “serious” Sherlock Holmes story anywhere and/or in any period of time. However, there are some places where a Sherlock Holmes-style story would be hilariously silly (eg: a sixth form college, a supermarket etc…). If you set your story in one of these places, then the potential for comedy is endless. A smarter way of doing this, which I used in my own parody stories, is to set the story in the modern day but to use the “Victorian” version of Holmes and Watson (or similar characters). It might just be my sense of humour, but there’s something absolutely hilarious about seeing Victorian characters in modern settings. 4) Deductions: One of the things that Sherlock Holmes is most well-renowned for is his deductions. This is where he can work out everything about something or someone through nothing more than careful observation. After deducing something, Sherlock Holmes always explains how he has done it. It doesn’t take a genuis to see the potential for comedy here. Although I haven’t seen that many examples of this, one of the things that I absolutely love is when fiction and/or comics writers come up with shorter stories that are based on their longer stories. A great example of a great writer who did this is probably Billy Martin (who published under the pen name of “Poppy Z. Brite”), before he retired from writing. Each of his first two short story collections contained one story featuring some of the characters from his first two novels (the short stories are called “How To Get Ahead In New York” and “Vine Of The Soul”). Shorter stories that are based on longer stories give writers a chance to explore elements of their stories that they didn’t have room for in their longer comics or novels. They also allow a writer to re-visit their favourite stories, without committing themselves to a full-length comic or novel. They are, obviously, also something extra for the fans too. 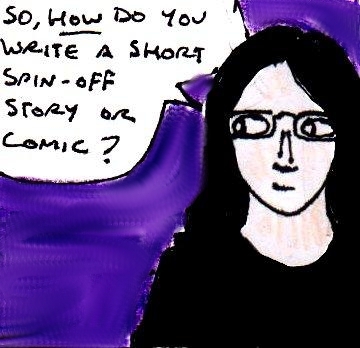 1) Brief introductions: Even though these short stories are mainly intended for people who have read your longer comics or stories, you still need to accept the fact that new readers will probably read them too. As such, it also haa to work as a stand-alone story, as well as an extension to your longer story. What this means is that you’ll have to briefly re-explain or summarise any important story or character information from your longer works that is relevant to what is happening in your short story. Although this will mean that new readers will see plot spoilers for your longer stories, this isn’t as much of an issue as you might think. Since you’re only describing these things briefly, new readers who enjoyed your short story will probably be curious about how or why these things happened. Plus, if they like your characters, then they’ll want to see more of them – even if they know the ending to your longer story. 2) Focus on other characters: Another good way to write an interesting shorter story is to focus on one of the supporting characters from your longer story or comic. Since these characters should be as interesting (or more interesting) than the main character, but will have slightly less character development than your main character does – your audience will probably be curious about them. As such, they are the perfect subject for a short story. A good example of this would probably be a short story by Mike Carey that was published in an anthology of zombie fiction I read about five years ago. Since my copy of this book is under a pile of other books and is difficult to reach, I can’t remember the exact story title. But, it was a spin-off story that was based on his excellent “Felix Castor” series of hardboiled supernatural detective/horror novels. However, rather than featuring another one of Felix Castor’s cases, this story focuses on the backstory of one of the other characters from the novels – a zombie called Nicky. Since Mike Carey has a really interesting take on the zombie genre (eg: zombies still retain their intelligence and personality, but they have no legal rights and their bodies can’t heal themselves) it was really interesting to see slightly more of this in a short story. 3) Fill in some gaps: One of the best ways to come up with ideas for shorter stories that your fans will love is to see if there’s anything in your longer novels or comics that you didn’t really have a chance to explain or explore properly. For example, you could show a mysterious part of your main character’s backstory that you only hinted at in your original novel or comic or you could show an interesting location that you only had time to mention briefly in your main story. I’m sure you get the idea…..
Let me start by saying that, although the two genres are similar, you should never confuse the action genre with the thriller genre. Although thriller stories might feature scenes of thrilling action, they’re more about the protagonist outsmarting the antagonists than about the protagonist fighting the antagonists. In fact, a good protagonist in a thriller story should avoid violence as much as possible. The action genre, on the other hand, is a little bit more mindless. It consists of mindlessly violent stories, comics, films and games that are designed to tap into the most primitive parts of our minds and make us vicariously feel like we’re badasses. 1) Context And Morality: Even if your story consists of your main character doing nothing but fighting people, you still have to think very carefully about context and morality. We’ve all seen action movies which feature absolutely bizarre fight scenes. No, I’m not talking about characters fighting with unusual weapons, I’m talking about characters fighting in situations where a fight wouldn’t realistically happen. In other words, if you’re going to include a scene of mindless violence in your story, it has to happen in a situation where your audience would expect a fight to happen. Yes, you can show your main character battling hordes of henchmen when he or she is sneaking into the villain’s headquarters, but showing your main character randomly starting a martial arts fight in- say- a swimming pool is probably going to confuse your readers rather than thrill them. Likewise, the moral context of the mindless violence in your action story can be the difference between something that will thrill your audience and something that will horrify them. Yes, in real life, violence is rarely (if ever) morally good in any way. But, in fiction, it’s a totally different story. To give you an example of what I’m talking about, I refer you to the first-person shooter genre of computer games. Notice how, in virtually all of these games, you fight against equally-matched enemies or against enemies that are more powerful or more numerous than you. This is because making the audience identify with someone powerful who attacks someone weaker quite rightly makes the audience feel like they’re bullies, rather than badasses. Likewise, notice how the characters that you fight in almost every FPS game generally tend to be evil characters (I mean, there’s a good reason why the very first popular FPS game was set during the second world war. There’s absolutely no moral ambiguity whatsoever when it comes to fighting against nazis). Also, be sure to notice how these evil characters will often attack you first, usually as soon as they see you. Showing the main character fighting someone without a “good reason” to do so in an action story just makes them look evil, rather than heroic. 2) Fairness: Although it might be tempting to make the protagonist of your action story or comic an invulnerable god or goddess with superhuman abilities, this is a bad idea. Even though your protagonist may be an expert in combat, it’s important to remember that they’re still human. This doesn’t mean that you should show them actually experiencing the realistic effects of violence (eg: serious injuries, death etc…), but you should at least pay lip service to this. Why? Because showing that your main characters aren’t invulnerable actually makes your audience think that they’re more impressive. If your main character emerges victorious from a dramatic fight with three heavily-armed opponents with a few cuts and bruises, this shows the audience that there’s a chance that the main character could have lost but didn’t because of his or her expertise at combat. However, if your main character emerges completely unscathed, then it’s less impressive because your audience knows that your character wasn’t really in any danger at all. For a good example of this, I’ll mention something that I mentioned in my review of the fifth “Die Hard” movie. In the first “Die Hard” movie, John McClane suffers a serious injury after treading on some broken glass. Not only does this reinforce the fact that he’s only human, it also makes the fact that he still manages to defeat the villains despite these injuries, even more impressive. Now, watch the fifth “Die Hard” film. At no point in this film does it seem like John McClane is actually in any danger. He can stand next to explosions and not even be knocked over. He can fall spectacular distances and get up, like nothing has happened to him. He’s invincible and, as such, anything he achieves is less impressive as a result. 3) Pacing: Yes, the action genre is considerably more violent than most other genres, but have you ever noticed how even the cheesiest action movie consists of more than just ninety minutes of constant fighting. There’s usually at least a couple of non-violent scenes in there. There’s a good reason for this. Watching or reading about literally nothing but constant fighting gets boring after a while. Even game designers in the heyday of the FPS genre (eg: most of the 1990s) recognised this fact and often included things like puzzles and explorable areas to break up the action slightly. In other words, if you’re making something in the action genre, you need to give your audience a break from mindless violence every now and then. It may sound counter-intuitive, but it’ll actually make them more interested rather than less interested.